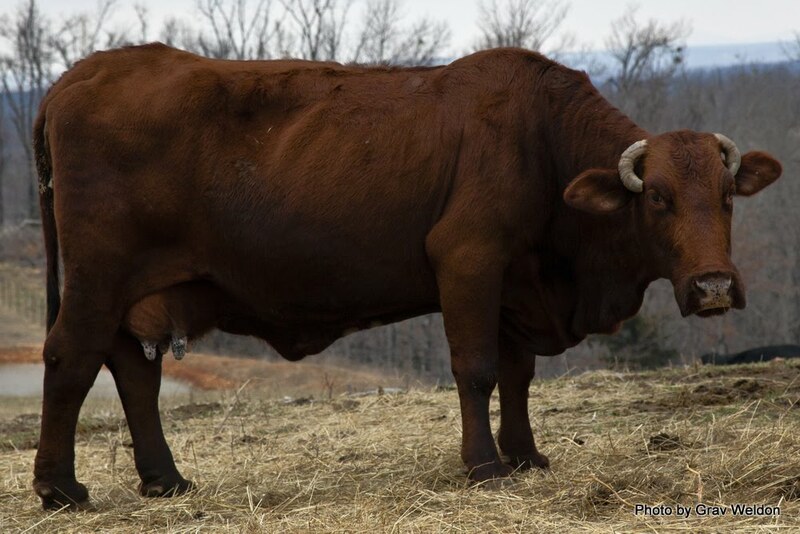 Ratchford Farms’ buffalo and cattle are spring-fed, raised on clover and Bermuda grass and live low-stress lives outside of Marshall. “C’mon, buffalo!” L.C. Ratchford hollered as he stepped out into the pasture behind his house. His cowboy boots thumped quietly in the dusty shorn grass as he wandered towards the back end of the rise. For a few moments, it was quiet. 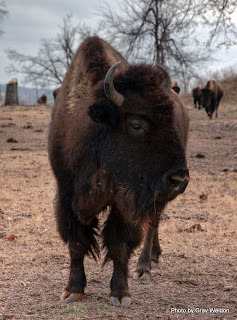 “C’mon… buffalo!” he called again, and there was the sound of distant footfalls, heavy but hurried. And they came running, around 20 buffalo appearing over the rise in the hill, galumphing and huffing their way across the yard to the fence where we stood waiting with food pellets, “treats” they looked for as they snorted the ground, that they found in my outstretched hand with long, giraffe-like black pointed tongues. “Get your hand on out there, it’s okay,” he prodded me, and I held my hand closer. The buffalo huffed into my hand and about inhaled one of the pellets, continuing to flick at my hand for another moment after the food was gone. I was surprised by how small its teeth were in that massive wooly horned head. “They’re very friendly,” I commented, still a little overwhelmed by the beasts. 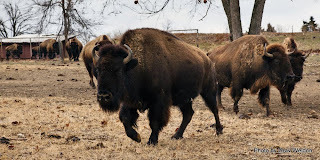 I had been prepared for the sight of the buffalo but not the sound -- the reverberation of their heavy hooves on the winter-drawn turf, the clearly audible breathing all asserting the presence of these majestic animals right here, right now. I reached for my pen to take some notes and realized my hand was covered in buffalo mucus. I started to wipe my hands on my jeans but L.C.’s sister Sheila clucked at me and offered a handful of paper towels. I took them gratefully but shrugged at the suggestion I was messing up my pants. I was working. It was expected. 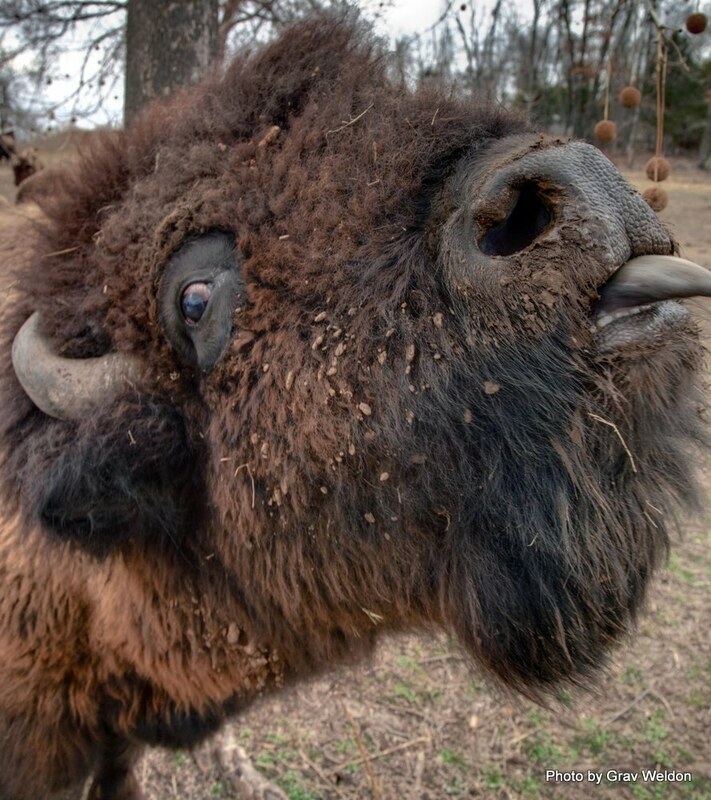 Besides, it’s not every day you get buffalo spit on you. Ratchford Farms is about six miles northeast of Marshall. When you drive up it doesn’t look like much, just a small house and shed that may or not have a few buffalo in the yard. L.C. introduced me to a good part of his family -- three of his four sisters, his mother and a niece -- before we headed out to investigate the farm. Along the way he shared a dialogue about the farm, the buffalo and other livestock and what he’s hoping to accomplish here. 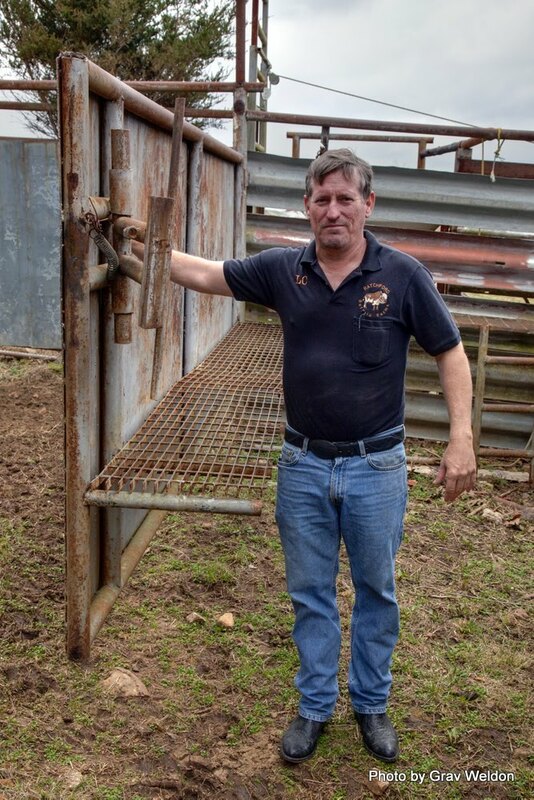 He’s had this dream to run this farm all his life, but when he graduated from high school he left out and went to welding school, spending 24 years as a contract welder, saving and investing his money so he could eventually get back to Marshall and acquire the land he needed for his venture. His welding background has served him well. 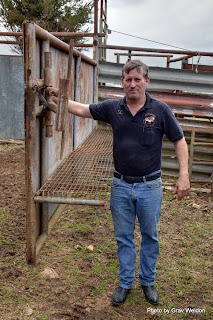 All of the fencing around the 400 acre homestead is his work, including steel fencing around the pastures where the buffalo roam and veritable miles of barbed wire strung tight between recycled highway sign posts. 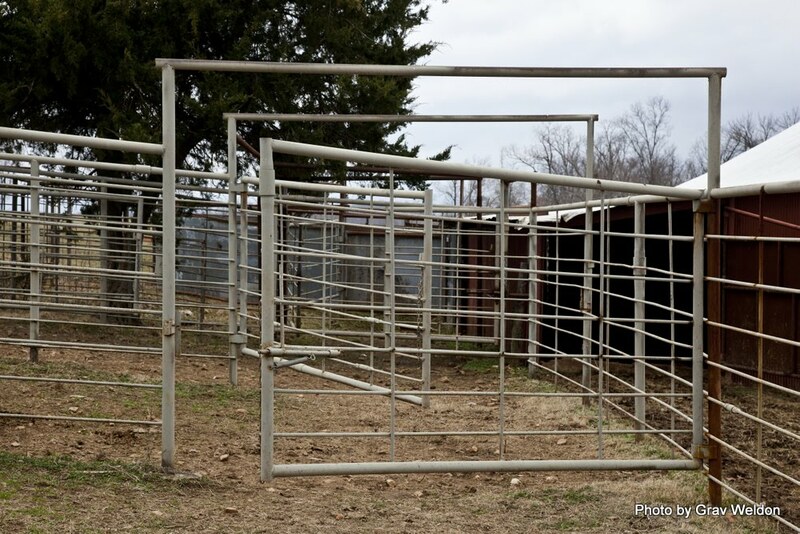 The 10 foot tall, 20 foot square corrals he’s built on the site are made from recycled oil field pipe; the retaining pen where he can work on the animals constructed from reclaimed I-beams and highway guard rail. It’s a beautiful expanse, patched together over the years with purchases of one tract of land at a time. The original homestead spanned a valley running a mile and three quarters long. There Otis and Marge Ratchford, L.C.’s parents, started farming in 1957. They planted strawberries, corn, green beans, whatever they needed. The couple and eventually their six children worked the land by hand. 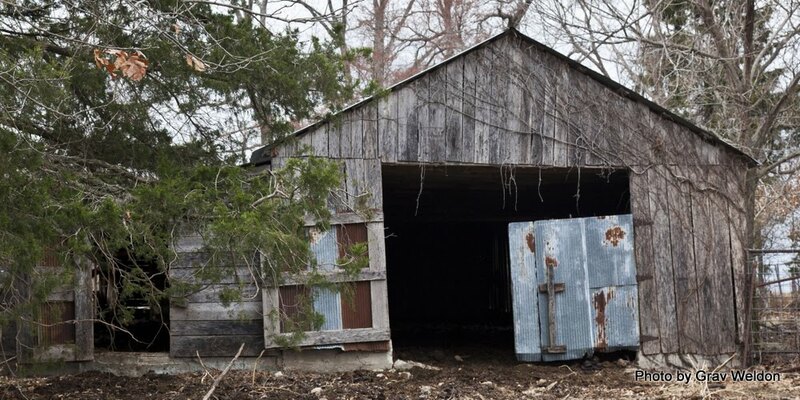 “I worked it just as much as he did,” said Marge, speaking of Otis and the old farm. 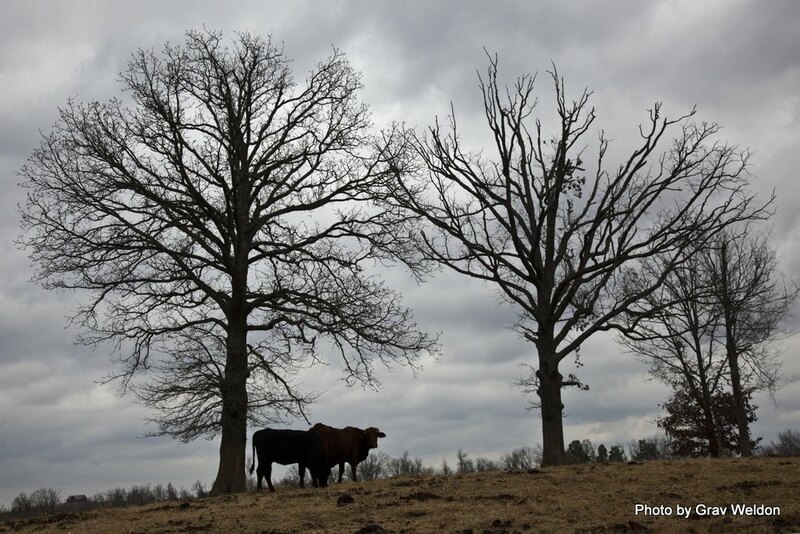 “We had tomatoes, cane for molasses, we had to raise everything for our own food.” They had chickens, ate their own eggs, drank milk from their cows and baled their own hay. About all they couldn’t get was flour and fuel. They’ve always had cattle. L.C.’s great grandfather served in the Civil War for the South. 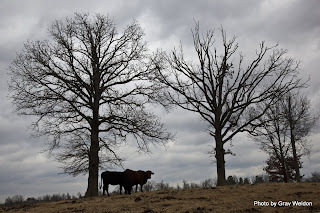 After the war he drove a herd of cattle from Georgia all the way to Searcy County and settled down. “We worked real hard on our herd, built it from Holsteins and Jerseys,” Marge told me. 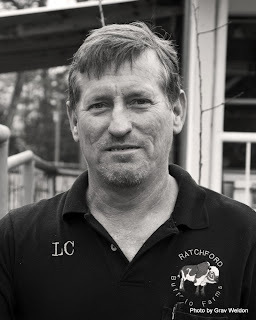 “The family idea has always been to keep good cows and buy good bulls,” L.C. added. The family has worked more than 150 years to foster the traits they wanted -- lower birth-weight calves so that the cows can calve without assistance, good marbling to the meat, a good disposition and an optimum prime weight of 1000 to 1200 pounds. About three years ago, L.C. started receiving interest from buyers for spring-fed cattle. 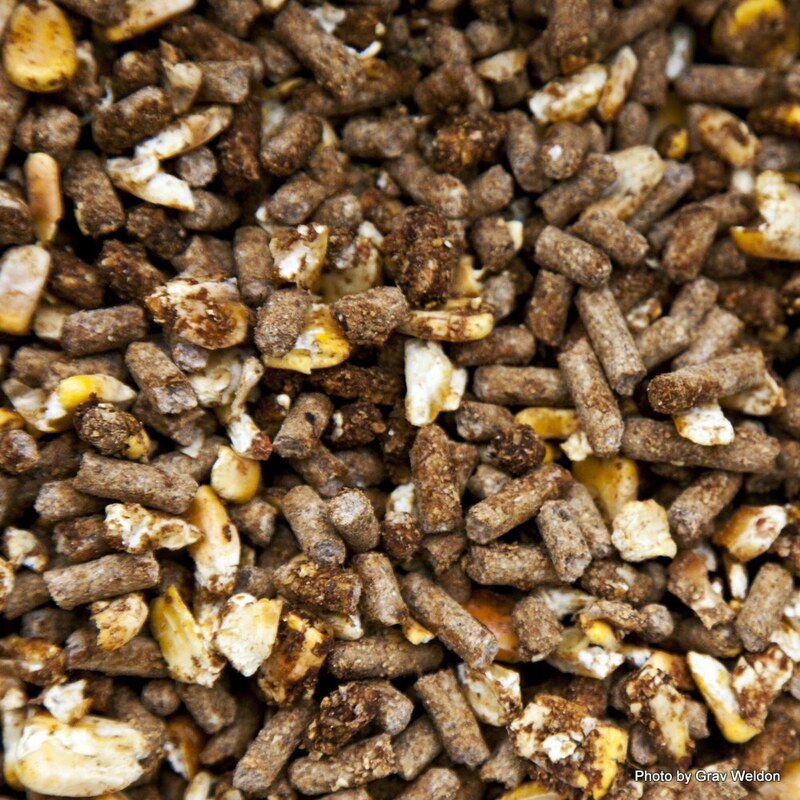 Being green means not using chemical pesticides, filler feed products or wasteful practices. L.C. manages to take care of all three problems with his approach to grass seeding and insect control. L.C. has lime brought out onto the fields by an 18- wheeler load once a year. It’s spread out . Because the seed is in the feed and the cattle defecate everywhere, there’s no need to bring in a crew to seed the farm each year. Lime breaks down the organic matter and kills certain parasites. The way the feed and the lime are laid out there’s no risk of chemicals getting into the runoff water. Ah, that water. 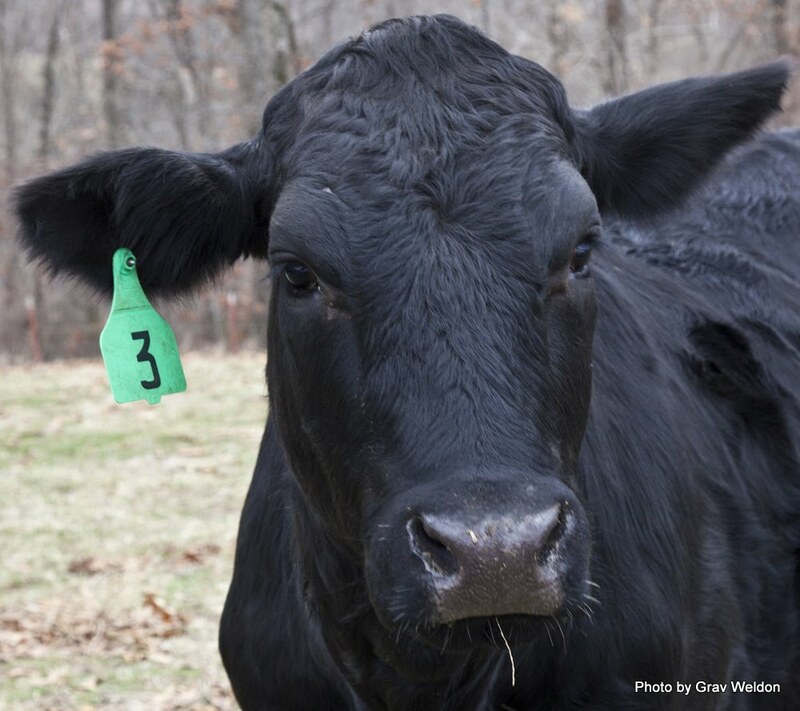 “Spring-fed” isn’t just a catchy turn of phrase, it’s the basis for a new approach to chemical free, healthy livestock. The rush for food pellets over, the buffalo slowly grazed and huffed a bit here, grouping and ungrouping across the space. 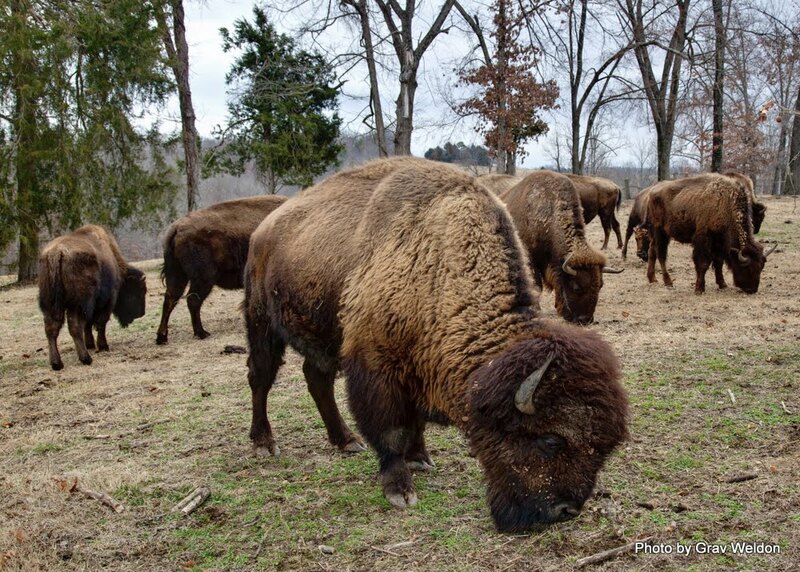 “We don’t use any steroids or hormones on the buffalo. See what’s happening over there?” L.C. asked, pointing at a smaller enclosure with a trough. There were bars that prevented the adults from entering. “The babies are able to get in there and eat this granola that’s just like what you and I eat,” he told me. He showed me a bin that contained the product, a mix of oats and corn and tiny ground food pellets. 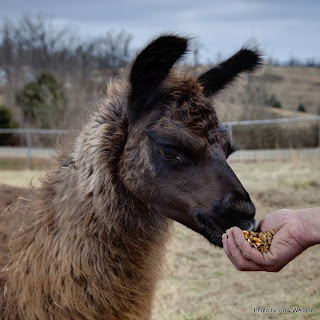 The adults are pasture-fed most of the year, and when the grass is gone they’re fed locally grown grass hay. 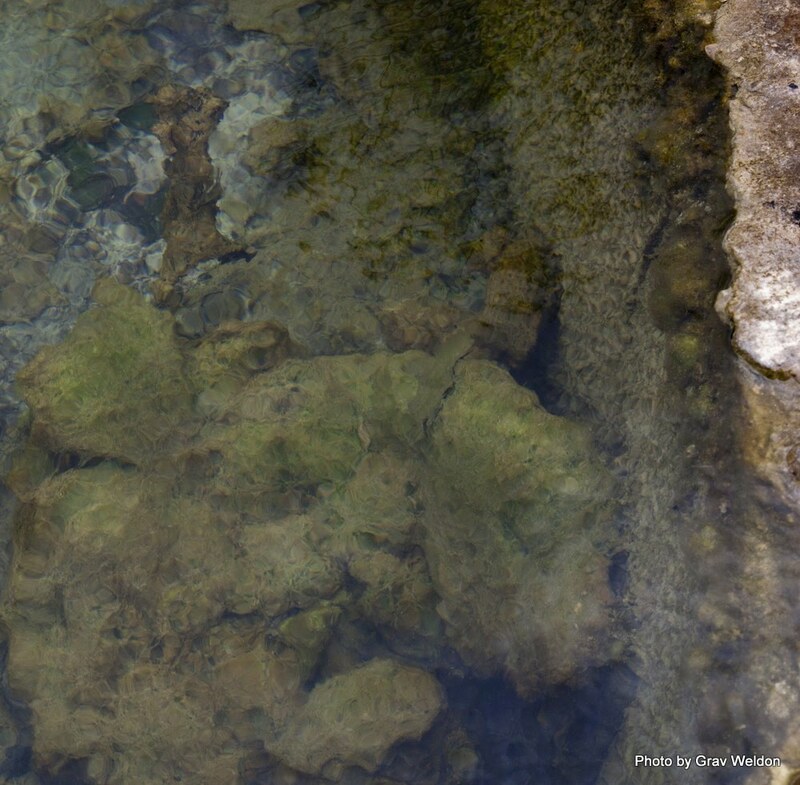 Eleven live springs on the property make that possible, along with a great deal of piping to take the water to stations set up throughout the land. 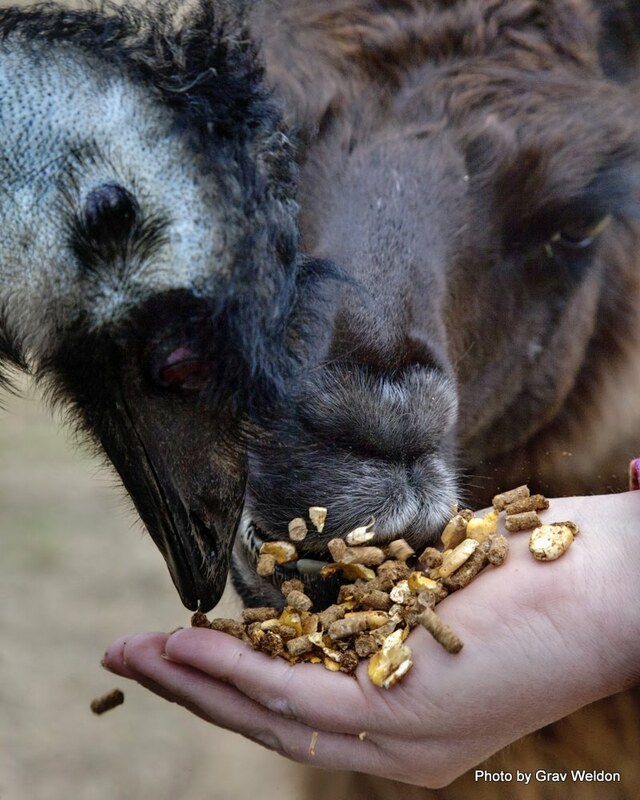 All the animals benefit from it -- the buffalo, the cattle, the emus and the llama too. 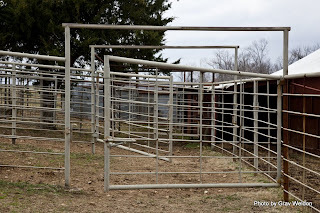 The buffalo herd housed here is nine to ten years old. Unlike cattle, buffalo bulls take six to seven years to reach maturity. Buffalo cows won’t have their first calves until they’re three but over the course of their lives (up to 35 years) they could calve 30 times. But they are dangerous, which is why they can’t be raised like cattle. 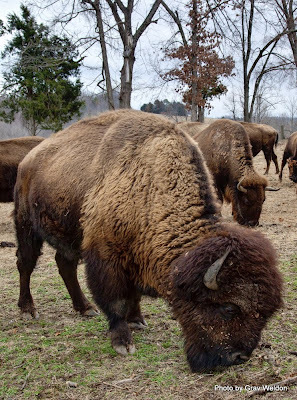 “Buffalo have no natural predators but man. They can kill a bear. They can kill a coyote or a dog. They are wild animals,” L.C. reiterated. A couple of males took off after each other on one side of the field, two males fighting for a little dominance. Their skirmish included running and bumping against each other… and that was about it. They settled whatever it was they were arguing over and came back, huffing out in that way all these buffalo tended to do, like kids trying to see who could get the bigger plume of steam drop from their lips on a very cold day. There are about 50 head of buffalo at Ratchford Farms. This is a breeding farm. Most of the animals here ensure that there will be a fine selection of buffalo to breed from in the future. 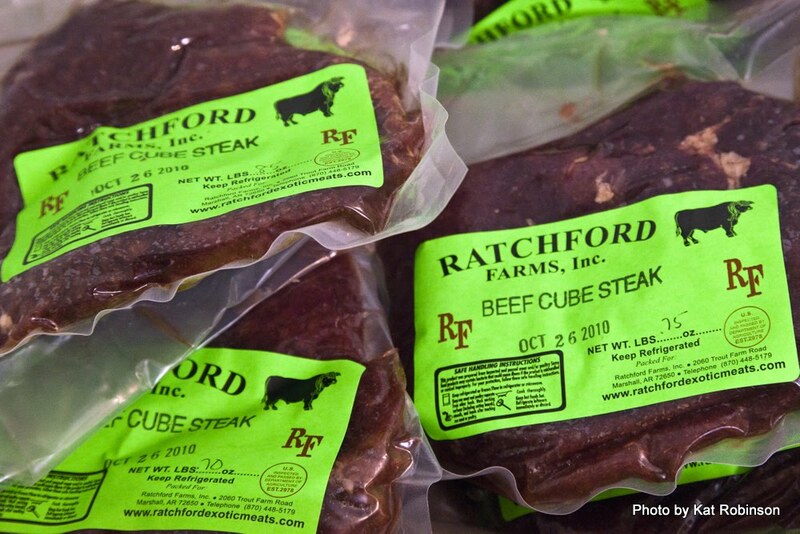 Ratchford also uses meat from other farms he’s networked with, who follow the same practices of all-natural feed, spring water and low-stress for the animals. We went over to check out another enclosure. Four animals share this acre -- three emu and a llama named Brown, who came up and ate from my hand. All of these animals were rescued and live a calm, quiet life on Ratchford’s farm. 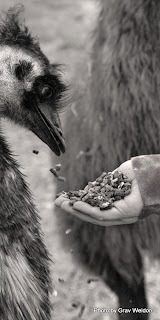 “I’d like to get a couple of ostriches, too,” he mentioned as Brown daintily nibbled feed out of my hand. After an inspection of the pen area and a stop in a field of cows, we headed out towards the old homestead. It’s in a valley a couple of ridges over from the front house where L.C. lives. There, more stations for livestock with clear, clean running spring water. 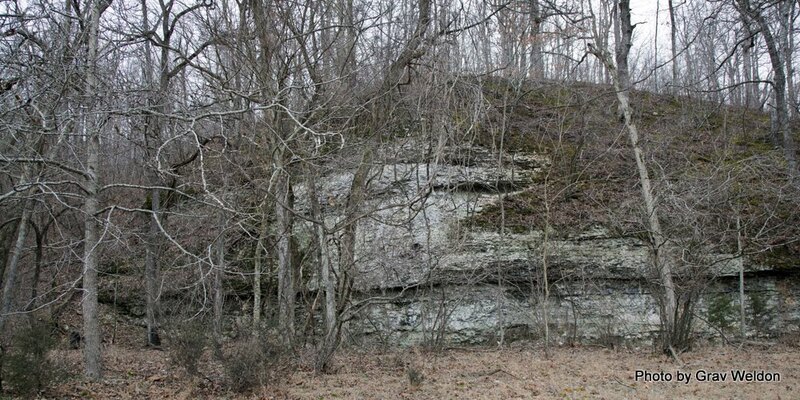 Along the west side of the valley ran a long low ridge with a steep dropoff. 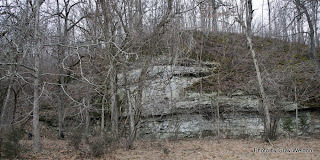 Next to it ran a creek and a long flat plain, separated from time to time by stands of walnut and cedar trees. This is what they called the buffalo jump -- a cliff with a cave in it which might have once been where Native Americans ran off a few buffalo at a time to perish at the bottom. Being by a creek meant easy cleaning and a place to camp. Sheila recalls walking along there as a child. “I’d go back here and pick up arrowheads,” she told me. We traveled up another steep hill to the back side of the property, where more highway-post and barbed wire fencing was tucked into high grass. “We keep this wild for wildlife like bobwhite quail, turkey and deer,” L.C. said. “We’re really selective about the trees we harvest -- we only take a few and we use a lot of the dead wood for firewood. There’s no clear-cutting here.” Up on top we came across a small pond. “It’s water for the cattle and the wildlife, and there are fish in there for the raccoons and such.” Little rings of water popped on the surface as we passed by. We scared up a quartet of whitetail deer near the back corner. L.C. stepped out and hollered “Daisy! Come get your bottle!” and one of them stopped and hung back a bit, trying to decide if she wanted to turn back or head on. She hesitated for just a few moments before dashing back off with the fellow deer. Heading back down the hill and up the next one, we came over a ridge where about half the cows were laying on their briskets, relaxing in the blowing mist. There were calves frolicking on the ridge -- and across the way on the next ridge, L.C. 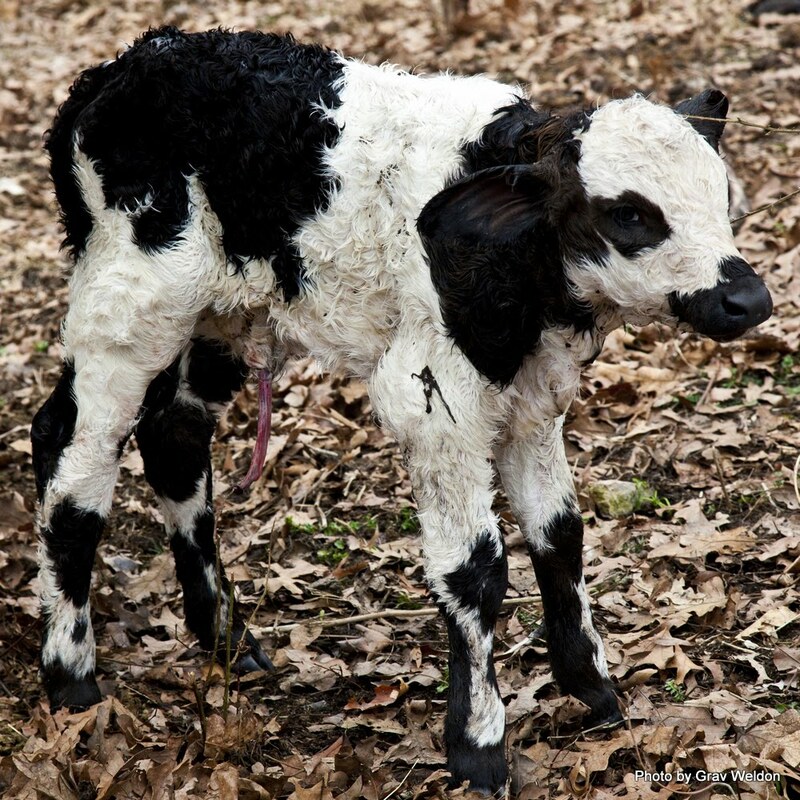 spotted another cow -- a white cow with liver colored spots. “I think she’s done had her baby,” Madge said. “Can you see it?” L.C. asked. 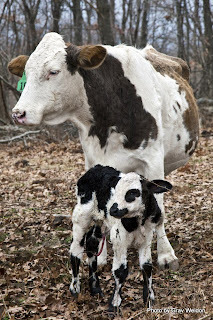 We drove around to the other ridge -- and there just inside the edge of the woods stood this cow and her hours-old calf, white with black spots, with large ears and umbilical cord showing. “Ugly!” L.C. joked. Everyone in the SUV commented about how cute the newborn was -- but as L.C. pointed out, only the purely black ones get the top dollar at market. This calf may be more than half Angus, but he won’t sell as one. An old pig barn still stands from where L.C. used to swab it out after the pigs had sheltered there. The manure was used to fertilize strawberry fields. He’s hoping to reacquire pigs for this purpose. He has an acre planted in blueberries and all sorts of trees and bushes coming in -- nectarines, figs, muscadines, apples and pears. What produce that’s not used on the farm or by the family will go to local certified farmers markets. The beef, buffalo and elk (which is raised on a farm in Missouri because of the rules about raising elk in or near the Buffalo National River) are distributed in three states -- Arkansas, Missouri and Oklahoma -- by Ratchford and a couple of others. It’s still a small operation with just three vans delivering fresh meat, sausages and jerky to around a thousand locations in the area, but he hopes one day it will grow. So the question is, is there really any difference in flavor between beef raised commercially and Ratchford’s spring-fed beef? I didn’t have to wait for the opportunity to give it a try. When we arrived back at the main house L.C. 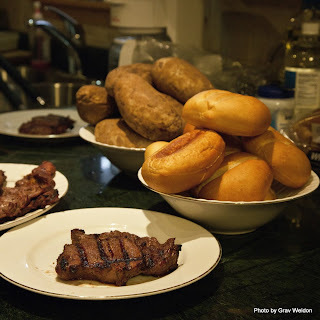 took to the grill while the sisters pulled out salad, baked potatoes, rolls and dessert. 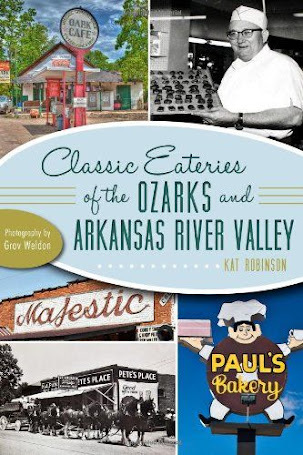 I was ogling the strawberry shortcake, a recipe from Madge’s family that ran back to the Civil War, when he came through and delivered a steak to me. The color was nicely brown with a good char on it from where the meat had sat on the grill. It had lovely reddish notes to it. I sliced in and found a nice pink throughout the meat, a perfect medium rare. And the flavor? 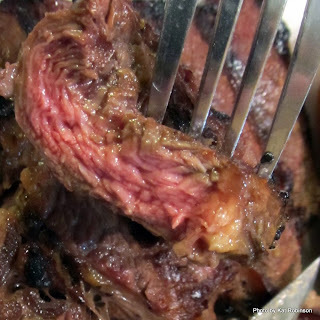 There was something pleasantly mellow about the beef, how it took a little smokiness from the cooking and notes of grapes and fruit from the homemade wine marinade L.C. had used. It was a very good steak. 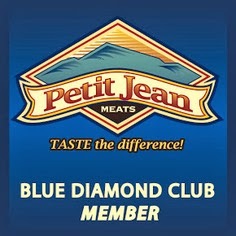 Thing is, it’s the sausages, jerky and snack sticks Ratchford Farms is best known for. 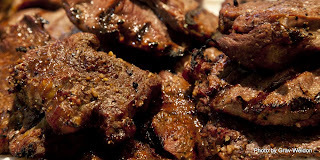 They’re well thought out treats, nicely seasoned according to their flavor (mild, spicy and teriyaki) and sell well for the traveler and sportsman. 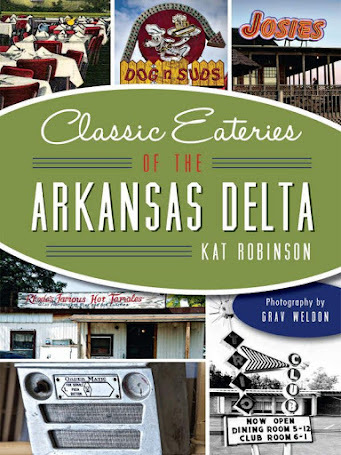 If you’ve spent anytime outdoors in Arkansas and have frequented bait shops, convenience stores or sporting good locations, you’ve probably seen these products. We sat around for a little while after dining, sharing stories about family pets and people we knew in common in the area. The Ratchfords are a comfortable bunch, and it’s no wonder they were named the Searcy County Farm Family of the Year back in 2009. I found I wouldn’t have minded staying a bit longer, but I had a long trip back. I look forward to making their acquaintance again. If you're interested in trying some of Ratchford Farms' meats, check with your local grocer. Argenta Market carries beef and buffalo in-store in North Little Rock, for instance. 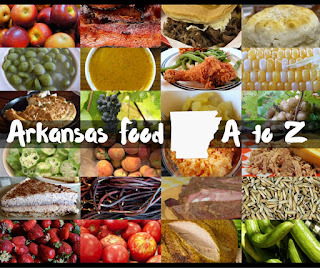 All sorts of places in the three state area (Arkansas, Oklahoma and Missouri) carry Ratchford Farms jerky, summer sausage and snack sticks. 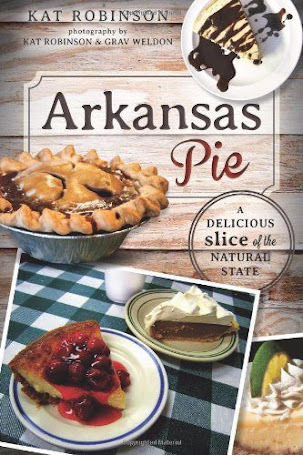 If you'd like to order direct from the farm, check out the Ratchford Farm website or call (870) 448-5159. No matter where you go, the same basic routine is always there - see the sights, taste the food, and take lots of pictures. The only difference, of course, is that each location has boasts its own tourist spots and delicacies. I've lived in the city my whole life and last year, we went to Arkansas and it was the first time I've ever been in a farm. It was an amazing experience for me. I love the scent of fresh hays and waking up with fresh milk and meat for my breakfast.